Buried Philosophe British Cemetery, Mazingarbe. 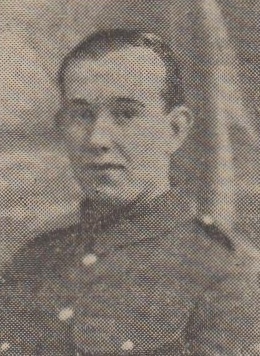 News is to hand that Private John Nuttall of Hud Rake, Haslingden, who was a sailor before he became a soldier, was killed at the front on May 6th 1917. Twenty three years of age, he leaves a wife and a child aged two. When 13 he went to sea, afterwards sailed before the mast, and returned to Haslingden at the age of 17. Loving the adventure of a life away from home, he enlisted in the Lancashire Fusiliers six months later, and on his discharge he again returned to Haslingden, and obtained employment at Baxter's Brewery. When war broke out the life of the Service again captured his imagination, and with characteristic patriotism he volunteered for and was passed into the East Lancashire Regiment on September 2nd 1914. In the following year he was overtaken by trench feet, and he was invalided home in November of that year. Returning to the front in October 1916, he was transferred to the Suffolk Regiment, in which he fell. "Your husband was good as a physical drill and bayonet instructor," writes an officer to Mrs. Nuttall, "and his death will be deeply felt by me and his friends, as he will be very hard to replace." It is believed that Pte. Nuttall was killed by a bursting shell. He has a brother who has served in Egypt and is now in France, and four of his wife's five brothers are with the colours. The fifth is not of military age. In loving memory of Private John Nuttall, Suffolk Regiment, killed in action, May 6th 1917. But in our hearts he liveth still." From his loving Wife and Child, 39, Hud rake, Haslingden.